Traditionally called the 'St Swithun Psalter' because it contains a prayer to the saint, this psalter's origins can be placed at Winchester, probably at the Cathedral Priory, which is dedicated to him. It is beautifully illustrated with a series of full-page tinted drawings which probably reflect the tastes and high social status of Hugh of Blois, Bishop of Winchester (1129-1171), patron of the arts, and brother of King Stephen. Hugh had been a monk at the great monastery at Cluny where sumptuous visual art abounded. The psalter, though, was made in England, having some details which relate back to 11th Anglo-Saxon manuscripts. Hugh of Blois may have used it as a prayerbook either privately or during the daily monastic prayers called the divine office. 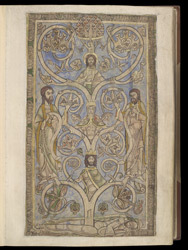 The Tree of Jesse often appears at the beginning of medieval psalters. It represents the ancestry of Christ, emphasising his descent from David, who was believed to be the author of the Psalms. Here the tree grows from the loins of the sleeping Jesse, its trunk formed of figures of David, the Virgin and Christ. Two Old Testament prophets flank it, their scrolls echoing the curves of the branches. The dove of the Holy Spirit descends over Christ from the top of the tree.